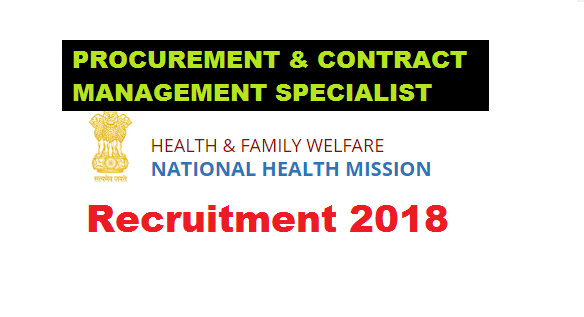 National Health Mission (NHM), Assam Recruitment 2018 notification is out for filling up posts of Procurement & Contract Management Specialist Online applications are invited from the candidates willing to work in mission mode for engagement on contractual basis for the following position under National Health Mission (NHM), Assam. Candidates have to apply online in the NHM, Assam website https://nhm.assam.gov.in. (B) EXPERIENCE: 10 years’ experience in Procurement preferably in Government or semi-Government organization or Public Sector Unit or Commercial organization of repute in management position. (C) IT SKILLS: The candidate shall be proficient In the use of Internet based applications. Office Package (MS-Word. MS-Excel. MS-PowerPoint). and other related applications. (i) Candidates having PDPP or CPPP from World Bank will be preferred. (ii) Candidates with hands-on experience of e-procurement / GEM / e-tender in Govt. are preferred. (iii) Working Experience in Health Sector related Organizations or Departments is preferred although not compulsory. (iv) Experience of working in complex, multi stakeholder, fast moving environment and ability to work under pressure, respecting strict deadlines and multi-tasking. BRIEF DUTIES: He/She will be the head of procurement operations under NHM with responsibility of overall design, planning and implementation of all procurement activities related to goods, services, drugs & consumables, equipment, etc. under NHM,Assam and managing the procurement team for planning and execution. REMUNERATION: Negotiable for suitable candidates as per market rates & last drawn remuneration. Only short listed candidates will be called for interview for which no TA/DA will be paid. List of shortlisted candidates will be published in the website https://nhm.assam.gov.in/ before the interview. No call letters will be sent for attending the interview.